The coaster looks fun. I have very little interest in Merlin's bullsh*t marketing ploys. Hopefully people don't focus too much on them and they just focus on the coaster itself so they don't set themselves up for disappointment. My thought after seeing the announcement was that the park ordered the world's most expensive flamethrowers. I agree it should be a solid ride, but another Thirteen esque marketing campaign for a ride like this is overkill. Nrthwnd wrote: ^ One is hoping that the FIRE is (for the most part) REAL. 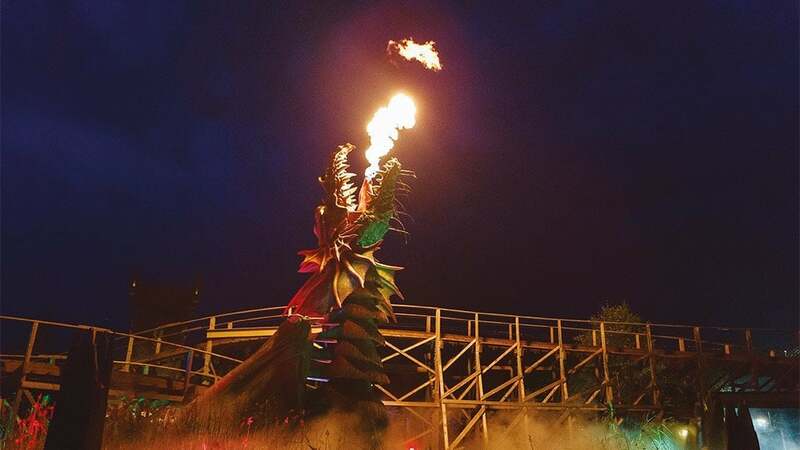 They are saying that it is "The world's first rollercoaster experience fusing wood and fire" (pretty sure Wodan and Apocalypse are also Woodies that have fire effects though) so it will be real. Joris en de Draak has basically a dragon that spits fire every few minutes, and I wouldn't be surprised if that there are more woodies. The only difference that they can make is by having the thing burn all the time instead of a burst of flames every now and then like the previous named all have. I wonder what environment effect that has. At Alton Towers Marketing (especially the SW series) I always love them. Their actually really fun, I never been to the park but still I can see these rides aren't really that worthy of that level of Marketing. Either way I really want to see this ride in action and see how they "Fuse" wood and fire in a unique way or not. coasterbill wrote: The coaster looks fun. I have very little interest in Merlin's bullsh*t marketing ploys. Hopefully people don't focus too much on them and they just focus on the coaster itself so they don't set themselves up for disappointment. Here is a new video from Alton Towers about Wicker Man and how they came up with the idea for the ride. In the video it is mentioned that "the huge theming feature, which is the Wicker Man himself, will burst into flames as you go through him". 8th January 2018: Alton Towers Resort has announced its latest ground-breaking thrill attraction set to open in Spring 2018 – Wicker Man. The project, previously known as ‘SW8’*, is the latest in a series of mould-breaking ride launches from the Staffordshire theme park that have helped define the industry. A world class team of experts continue to work on the new attraction, led by Great Coasters International, the world’s leading creators of wooden rollercoasters. The safety of guests has been paramount in the design and build of Wicker Man, incorporating the latest in proven safety technology, rigorous testing and hundreds of training hours for ride operators. Keep up to date on the latest Wicker Man details by visiting altontowers.com/wickerman or searching #WickerManRide across social media. Last edited by robbalvey on Mon Jan 08, 2018 3:12 pm. Last edited by robbalvey on Mon Jan 08, 2018 3:11 pm. Oh, but Robb, those are not fused together! They are just regular Fire FX.